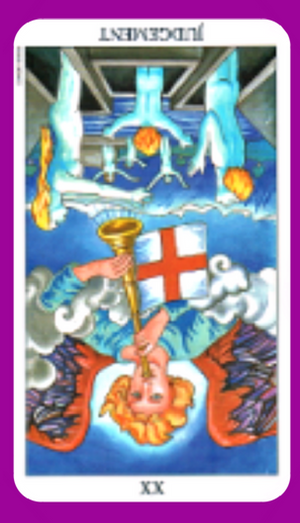 The Judgement tarot card is the 20th card in the major arcana that often signifies change and transformation when dealt in the upright position. Judgement, Self evaluation, Reflection, Renewal, Forgiveness. In general – This card indicates that your are going through or about to go through a time of self evaluation. You are reflecting on much that has happened in your life. This self awareness is a good thing and will give you more clarity on what you need to change, to be more true to yourself. The judgement card can also indicate you may be being too judgmental of others, or others may be too judgmental of you. 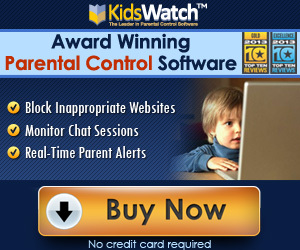 If you have a legal matter going on, it will be resolved. It is likely to go in your favor as long as you have been honest. NOTE: These tarot meanings are just a basic guide only. Tarot readings are never set in stone. Depending on where the card falls within the spread will determine the meaning, and whether the card refers to you the (querent-person seeking the answers) or someone around you. Tarot is a tool that can also help you to connect to your intuition. Listen to what your intuition is telling you when reading Tarot cards. 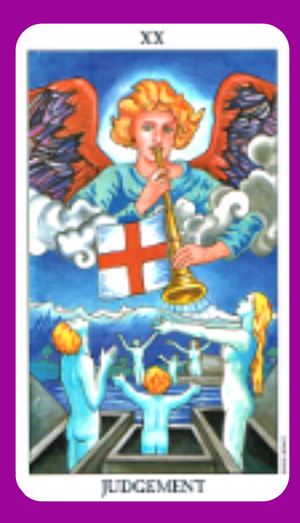 Discover the meaning of The Judgement tarot card reversed. This tarot card is the 20th card in the major arcana that is an indicator you may be judging yourself too harshly. In general – The Judgement card reversed indicates fears and self doubts are blocking you from making the decisions you need to make. This indecision could cause you to miss out on good opportunities. This card reversed can also mean you are being too critical of judging others. If this sounds like you ,or you have been spreading hurtful gossip about others, this card warns you to stop. Put your focus back on more positive things. On the flip side this card can also mean you are being too critical of yourself. You may be feeling regrets for various decisions or mistakes you have made in the past. Don’t be harsh on yourself, forgive yourself. Try to view these mistakes as all a part of learning. This card can also be an indicator that others are being too critical or judgmental of you. Don’t let this get to you. Focus on what you want to do, and do it. When it comes to legal matters, this card indicates that the outcome is likely to be unfair. Tarot Cards Falling Out When Shuffling: What Does It Mean?